This is a dish that I made before the Eggplant Braised in Marsala about which I wrote last month. It is equally delicious and went especially well with couscous. If it had occurred to me at the time, I would have added the Marsala, but it was under the radar at the time. Now that I have been using it, I am finding all kinds of uses for it. I am now firmly convinced that this is the best way to cook eggplant. 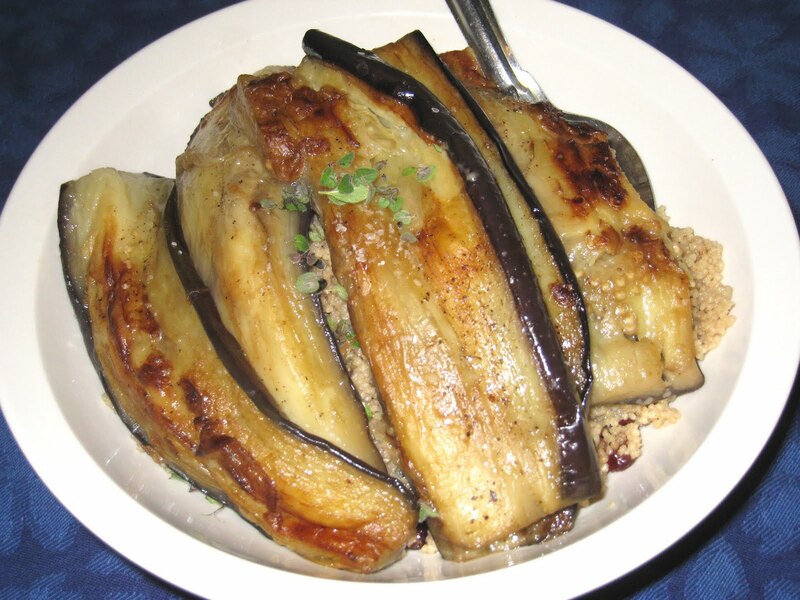 It is soft, and silky, and the long cooking time allows the flavor of the eggplant to shine. Couscous cooked with vegetable broth and cranberries highlighted the eggplant perfectly, I added a garnish of toasted walnuts for a contrasting texture, which was much needed. Trim the ends off the eggplant. Heat a scant tablespoon of oil in a large skillet over medium-high heat. Place the eggplant in the skillet, cut side down and in a single layer, and cook until browned, about 5 minutes. Turn the eggplant skin-side down and cook for another 5 minutes. Turn the eggplant back over and pour stock or water to cover about one inch of the eggplant. Reduce heat to low, cover, and braise until silky and tender, about 20 minutes. Remove from skillet and reduce the liquid to desired consistency for a sauce.